Note: For the planet Jupiter, please click here. 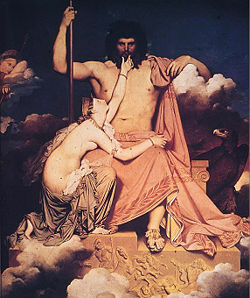 "Jupiter et Thétis," by Jean Ingres, 1811. Jupiter (Latin: Iuppiter, also known as Jove) was the supreme God in the Roman mythology pantheon. Like many of the figures of Roman mythology, Jupiter was appropriated from the Greeks, and is virtually identical to the supreme God Zeus in Greek mythology. Jupiter was known as the Roman god of the heavens and the sky. He was considered to be the patron deity of the Roman state, in charge of laws and social order. Along with Juno and Minerva, Jupiter was the chief member of the Capitoline Triad, a group of the three foremost deities in Roman religion. Roman worship of Jupiter has had a lasting impact upon the Western world. In English, the adjective "jovial," which comes from Jupiter's alternative name "Jove," is still used today to describe people who are jolly, optimistic, and buoyant in temperament. The god's name was also adopted as the title of the planet Jupiter, the fifth planet from the sun and the largest planet in our solar system. Additionally, Jupiter remains the origin of the weekday called "Thursday" in English. In Latin, Thursday is known as Iovis Dies or "Jupiter's Day" and many European langauges still refer to this day of the week in the connection to Jupiter, such as the French jeudi and the Italian giovedì. Jupiter or Iuppiter is a vocative compound derived from the archaic Latin Iovis and pater (Latin for father). Linguistic studies identify the Latin theonym Jupiter as having derived from the phonologically similar proto-Indo-European compound *dyēus- pəter-, which refers to the "Father God," ruler of the daytime sky. This is the very same deity from whom also derives the Sanskrit Dyaus or Dyaus Pita ("Sky Father") of the Vedas, the Germanic *Tiwaz, and of course the Greek Zeus. This word *dyēus- pəter- itself derives from the proto-Indo-European root diu, meaning “bright” or "to shine," referring to the light of the sun and sky in daytime. For the Romans, as well as other mythological systems derived from proto-Indo-European roots such as that of the Vedas and the Norse, the god of the sky was also the supreme god. Thus, the similarity between Jupiter's Latin title and those given to the celestial gods in the Sanskrit, Germanic and Greek languages provides strong linguistic evidence that the god had a connection to the Proto-Indo-European sky god. Jupiter's alternative title Jove, meanwhile, is an English formation based on Iov-, the stem of oblique cases of the Latin name for the Vedic Dyaus Pita. Jupiter was the son of Ops, the earth mother and Saturn, the prevailing sky god who ruled over the rest of the Roman pantheon. Saturn had usurped his oppressive father Caelus in order to assume the position of supremacy; however he quickly became tyrannical himself, heeding a prophecy claiming that one of his own sons would overthrow him. In order to prevent this from occurring, Saturn devoured all of his children as soon as they were born. Realizing that her next child Jupiter would be susceptible to the same treatment, Ops hid him as soon as he was born and offered Saturn a large stone wrapped in swaddling clothes in his place. Saturn swallowed the stone, and was forced to disgorge Jupiter's siblings in the process of ridding it from his digestive system. Jupiter returned from hiding to overthrow Saturn, assuming leadership over the cosmos and forcing Saturn to flee to Italy. Considering his status as the supreme god in the Roman pantheon, it is not surprising that Jupiter enjoyed numerous romantic episodes and thereby sired many offspring. By Maia he is the father of Mercury, the god of commerce; by Dione, he fathered Venus, goddess of love, and by Ceres Proserpine, goddess of the spring. Diana bore Jupiter a son and a daughter—Apollo, god of the sun, and Diana, goddess of the moon, respectively. He is also considered to be the father of Minerva, goddess of wisdom. Jupiter's many functions varied along with his numerous epithets. 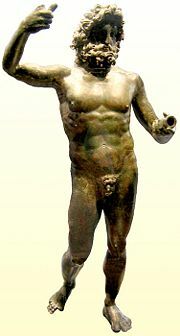 As Jupiter Fulgurator ("of the lightning") and Jupiter Tonans ("thunderer"), he was known as the God of the storms. As Jupiter Lucetius ("of the light"), he was esteemed as purveyor of the universe. Furthermore, Jupiter also had immense political significance. He was referred to as Juppiter Optimus Maximus Soter (the "best, greatest, saviour Jupiter"), which not only described his supremacy over the rest of the divine pantheon, but also marked his status as the patron deity of the Roman state, in charge of laws and social order. In his connection to justice, Jupiter was especially concerned with oaths, treaties, and leagues. For instance, Roman citizens swore an oath to Jupiter in their courts of law, uttering the phrase "By Jove!" to indicate that words were truthful in the name of God. Jupiter's connection with the conscience, obligation and trustworthiness was never quite lost throughout Roman history. Additionally, Jupiter defended Rome against foreign interests. As Jupiter Terminus or Jupiter Terminalus, the god was thought to defend the boundaries of Rome. As Jupiter Victor, he led Roman armies to victory, and as Jupiter Feretrius he helped carry away the subsequent spoils of war. As such, armies returning home victorious from the battlefield made sure to pass the Capitoline temple to Jupiter as a sign of gratefulness to their chief god. As a result of his status as the supreme god of the Roman empire, many temples were dedicated to Jupiter in Roman cities and colonies. The largest temple in Rome was that of Jupiter Optimus Maximus on the Capitoline Hill. This temple is also the oldest building dedicated to Jupiter, and its foundations are still in existence. Here Jupiter was worshipped alongside Juno and Minerva, the trio of deities who formed the Capitoline Triad. Construction of the building began under Tarquinius Priscus and was completed by the last king of Rome, Tarquinius Superbus. It was officially inaugurated on September 13, 509 B.C.E. at the beginning of the Republican era. On this day, the consuls sacrificed to Jupiter a white ox, his preferred offering, and they rendered thanks for the preservation of the state, which was followed by the feasting. The commemoration of this day became the pivotal event of the great Roman games. Jupiter was also worshipped by way of the lapides silices, a collection of pebbles or small stones, which were kept on the Capitoline Hill. These stones were used by Roman priests (called Fetiales) for symbolic ceremonies in which declarations of war and treaties were made official on behalf of the Roman state. In the ceremonies, the fetiales took one of these stones in their hand and then swore by Jupiter, dropping the stone at the last words. This oath made upon Iuppiter Lapis, or the Jupiter Stone, was considered by the Romans to be the most solemn oath possible . Considering Jupiter's function as ajudicator of oaths, it is not surprising that it was only in the presence of Jupiter's priests that the confarreatio, the most ancient and sacred form of marriage in the Roman tradition, took place. Jupiter Stator, Roman bronze from the Gallo-Roman religious centre of Gisacum, near Évreux. The original temple was rebuilt in marble after it was destroyed by fires in 83 B.C.E. Fires followed again in 69 C.E., when the Capitol was stormed by the supporters of Vitellius. However, the temple's ultimate dilapidation began in the fifth century, when Stilicho carried off the gold–plated doors and Narses removed many of the statues in 571 C.E. The surviving remains of the foundations and of the podium, most of which now lie underneath Palazzo Caffarelli, consisted of enormous parallel sections of walling made in blocks of grey tufa-quadriga stone (cappellaccio) bearing witness to the sheer enormity of the surface area of the temple's base (about 55 by 60 meters). All throughout the Roman Republic Jupiter was the central cult figure. Just as on the Capitoline Hill, Jupiter was worshiped on the peaks of hills across the rest of the Roman Empire as well. In addition, all places struck by lightning were considered to be his property and were demarcated as sacred by circular walls. Although with the rise of Augustus (approximately 43 B.C.E.) the Gods Apollo and Mars eventually came to rival Jupiter in preeminence, Augustus went to great lengths to ensure that Juppiter Optimus Maximus was not ousted from his position of supremacy in popular worship. Under Augustus, Jupiter came to be conceived of as the protecting deity of the reigning emperor of the state, much as he had been the protecting deity of the free republic in earlier times. As such, his worship spread over the entirety of the Roman Empire. Much like his Greek counterpart Zeus, Jupiter has had a lasting impact upon the Western world, despite his decline in his worship. For instance, the expression "by Jove!," once sworn in Roman courts, became a common colloquialism and is still used as an archaism today. In addition, the English adjective "jovial," which also takes its root from Jupiter's alternative moniker, is still used today to describe people who are jolly, optimistic, and buoyant in temperament. As well, the name of the god was adopted as the name of the planet Jupiter, fifth planet from the sun and fittingly the largest celestial body in our solar system. Jupiter was the original namesake of the weekday that would come to be known in English as Thursday. The contemporary name comes from the Old English Þunresdæg meaning "Day of Thor" (the comparable sky god of the Norse pantheon), this being a rough Germanic equivalent to the Latin Iovis Dies or "Jupiter's Day." Other Romantic languages use equivalent terms to refer to this day of the week, notable for their phonological resemblance the name of Jupiter, such as the French jeudi and the Italian giovedì. ↑ H.J. Rose, Italian "Sondergotter," The Journal of Roman Studies, 3, 237. 1913. Hornblower, Simon and Antony Spawforth (Eds.) "Jupiter." The Oxford Classical Dictionary. Oxford University Press, 2003. ISBN 0-19-860641-9. Platner, Samuel Ball and Ashby, Thomas. A Topographical Dictionary of Ancient Rome. London: Oxford University Press, 1929. Rose, H.J. "Italian 'Sondergotter.'" The Journal of Roman Studies 3, pp. 233-241. 1913. This page was last modified on 2 April 2008, at 10:08.